Today was a relaxing day for us, again. I do believe Mariah is much more comfortable with us as she is beginning to show her true personality! She can be a very busy little girl. She does an excellent job of entertaining herself! Soon she will learn the joy of siblings!! So many new things for this child. We have a five-year-old little girl in our group. We were boarding the bus for our shopping trip the other day and the little girl spoke in Mandarin to our facilitator and asked her what shopping was. The facilitator smiled and we all realized that this little one had no idea what that even was. Mariah is such a sweet little girl. She is eager to love on most of us now. I still notice a bit of holding back with me. I will give her the space she needs. Her heart is beginning to mend but it will take time. She has to learn to trust complete strangers speaking an entirely different language. Back to our subject at hand. We took our cruise this evening and met with our group in the lobby at 5:30pm. It was a dinner cruise. The bus took us to the docks and we boarded our ship. The food was okay. I am being forced to learn to use chopsticks! WOW! For the last part of the cruise they provided entertainment. So we had a woman juggle fruit, balance all kinds of things and just made us smile. Here was Mariah watching it all, of course on Daddy's lap. To top off the evening, while out on the deck of the boat, I moved my hair with my left hand and my diamond ring caught my left earring and the earring went flying. So, looks like I lost my gold hoop. All is well, at least it wasn't my ring. Tomorrow is our swearing in ceremony at the U.S. Consulate! We are with three other families from our agency. Hoping to post picture about that but we have been warned that NOTHING electronic will be permitted past security! Today (Monday) we decided to just take a break from the schedule. Our group went to the zoo today but we decided to just stay at the hotel and bond with Mariah. It is crazy humid here and I wasn't sure the animals would be out. Not to mention that Mariah's rash has moved up to her face now and she is scratching even more. Heat makes it much worse, so we stayed in. Can you see how tough the day was? We discovered how much Mariah likes bananas! She at an entire banana after breakfast. With that said, she can make a corn flake last an entire mealtime. Oh my, she is slow! I think there is just too much going on there at breakfast. There are people everywhere and she is busy watching. Once again, naptime had to be accomplished with singing from me. I'm really okay with that. She naps well. Usually her nap lasts 2 hours. Today we had to wake her up at 4pm. I thought if she slept longer it would ruin her night's sleep. We spoke with our kids in the States again on Skype. My poor Ben is now wheezing. Tammy is calling his pulmonologist. My guess is he needs on an oral steriod. We decided to go get a few groceries this evening. We needed some water and a few snacks for Mariah. So we ventured over to a different store. I'm not sure who designed these stores here but they certainly make it a challange to find almost anything. We bought raisins for Mariah as well as a box of Cheerios. Then we found some small juice boxes and thought she may like that too. Finding dinner spots was next to impossible! We finally did and managed to make it back to the hotel without it raining on us. Notice her face in the above picture. The mysterious rash has moved to her face. Mariah has come to life! She is gladly offering smiles and giggles to us. She gladly comes to me too. My mom and dad's roll is basically to play with her. They are enjoying this time but we are all ready to come home. I think I probably sound a little homesick. I know I write this on every post in my blog while in China. But honestly, I do miss my kids terribly. Especially when they are sick! The time here has been nice but we are ready to board that plane for the long flight home. My heart also is aching for some very sweet friends of ours. Their son, Alex, was in a terrible accident. Alex is serving in the military and is stationed in Italy. He was in a mountain bike accident and he injured his heart among other things. He is not doing well right now and his parents are desperately trying to get expedited passports to be with him and his family. He is a daddy and husband and could desperately use some prayer. Damage was done to his heart as an artery was punctured, twice. That is repaired but he is still not doing well. The doctors do not know if he will make it. Please pray for Alex Mace if you would. I will end this post with pictures from the city here. The fountain in the picture below is in front of our hotel. Honestly, you don't have to look at all these pictures. This is Mariah's story and I am doing this for her history. I would love to share this with all of you though. This is a picture from the shopping center across the street. The two buildings are both our hotel. There are two towers. We stayed at the tower on the right. Here is a picture of what the streets look like, from the pedestrians' perspective. This is the Friendship Store. This is not a typical American store. There are two buildings of this store with 7 floors to shop from. We needed the groceries but no one seemed to understand what I meant until one young woman said, "Oh, supermarket!" YES!!!! Well, we were in the wrong building. So we walked across to the second building and used the "lift" up to the fourth floor. That is where the supermarket was. But Jeremy wanted to look at their toy section. So, on we went. We had to find a different elevator and went up another floor to the fifth. Then we took two different escalators up to the seventh floor. I got tired just typing that! Tomorrow during the day is free time. In the evening we take a cruise on the Pearl River. They say how beautiful the lights on the buildings in Guangzhou are at night. I think Mariah will enjoy it too. It is hard for me to believe but today is Sunday in Ch*na. Sundays here look very different than Sundays back home. Church is not even mentioned. So, when we would normally be getting and getting dressed for Sunday school and church, we were casually eating our delicious breakfast here in Guangzhou. We headed out after breakfast to a shopping plaza like none I've ever seen! First of all, it was raining. I forgot to change from my flip-flops to my shoes and let's just say the flip-flops were smooth on the bottom. I was slipping every few steps. The walkway was a super smooth stone. I was glad to get indoors. The mall was covered walkways and laid out very differently than in the United States. It was six stories tall! We tried to borrow a stroller from the hotel but they were all out. So, with our baby and her terrible heat rash, we had to carry her. She does walk, but is a very new "walker". With the combination of crowds, a new walker, and just dirt.....we had to carry her. Here was a different section of the shopping area. Notice how wet the sidewalks are. Not good for flip-flops! Then to our rescue was Annette. She is in our Lifeline group and is here without her husband. He is home with their other children. Annette had a hotel stroller but was on a mission to find one while shopping that she could take home with her. So, she gave us her stroller and she bought one of her own. I found out that Annette's little one at home took the liberty to re-pack some of their things. In doing so, Annette had no toys for her baby girl. So, we purchased a toy for her to have. We actually bought one for Mariah as well. When we got dropped of at the hotel at 2 in the morning here in Guangzhou, we left Mariah's purple backpack on that van. Guess what was in that backpack.......all of Mariah's toys! After chewing on a few things that she should not, we bought her a new toy. She is getting a few teeth and wants to chew. We put Mariah in the stroller and she was fine until we had to take her down on an escalator. She was petrified! We are pretty sure it was her first time in a stroller and that did it for her. is no standard for shoe sizes. She may be a size 14 in one style but a size 3 in another. The best way to shop is try them on! Here are her new shoes!! We bought a few other small things.....Pleasant Goat being one. It is a DVD of an extremely popular cartoon here in China. Mariah lights up when she sees this character. So, we had to get her a DVD of her favorite cartoon. We came back to the hotel and decided to get some pictures of this beautiful place. There was a wedding happening and the bride was beautiful!!! She was standing outside of the banquet room greeting her guests. We took some more pictures of this beautiful place and decided to share here what our "home" away from home is like. The mural pictured below is behind the front desk. Jeremy read up on it and apparently it took 7 months to complete. This is a picture above the second set of glass doors as you walk into the lobby. One of my favorite parts of this lobby is the woodwork and the spiral wooden staircase. This is a picture of the beautiful flowers greeting you as you walk into the lobby. Then a super sweet friend I met on our Facebook group saw our sweet Mariah and knew she was miserable. She knocked on my door and rescued me by giving us some of her very own Benadryl for her baby. She just brought one of the hotel glasses with plenty of Benadryl. Christy, thank you so very much! This rash on Mariah is awful. I discovered something very sweet about Mariah. To get her to sleep, I can sing to her. How lovely is that? She was fighting sleep then screamed with me holding her and walking trying to get her to sleep. Then I just started singing to her. She settled right down. I refuse to just lay her down in her crib to sleep. After walking the halls of her orphanage, I am certain that is how she was put to sleep every day for 18 long months. I want her to know that her life is vastly different now. So if singing does it, then sing to her I will. We went shopping to find water and Pepsi for my dad. We found the Trust Mart which must be owned by Walmart. The brands there were Great Value. I have never experienced a city or cities that were as difficult to maneuver as it is here. There are very few ramps. There are stairs everywhere! They do not have handicap accessible anything here. I cannot imagine anyone in a wheelchair. We were frustrated with a stroller but a wheelchair? Tonight was a lazy night in the hotel until bedtime and Skyping with the family. We spoke with Tammy and our kids in Columbus. Poor kids still have so much congestion and coughing. They cannot wait to get their hands on Mariah. We cannot wait to have their arms around our necks and hugs and kisses all around! Our trip is winding down now. I cannot wait to get back and see my kiddos there. My sister Skyped me this afternoon at 1:30pm for me but 1:30am for her and my Ben woke her up with his coughing. He slept through it. I had her wake him and use his inhaler. She will likely have him to his pulmonologist later today. At the least she is making a phone call. I'm glad they are in Columbus close to Ben's doctors. Tomorrow is supposed to be a trip to the zoo but I think we have decided that Mariah needs a low key day here at the hotel. Too much stimlation is not quite what she needs. It was a short night's sleep for sure! We got to bed after 4am then had to be in our facilitator's hotel room by 9am for Mariah's visa picture. We went down and had one of the most delicious breakfasts ever!!!! Then we met with our Lifeline family and took a private bus to the appointment. Poor Mariah was so tired from the trip but she did great. So far (notice I said so far) Mariah is a laid back little girl. She is such a sweetheart. The grieving is still pretty hard. We have seen a few moments of smiles from her. It is impossible to get those on camera though. Can you tell how tired she is? We are amazed at her determination. She absolutely refuses the bottle that the orphanage told us was her primary source of nutrition. That is another way she shows her grieving to us. So, she has tried all new things to her palate. She seems to enjoy table food. I would like for her to take a bottle for a little while for bonding purposes. So, for today we went to the medical appointment. It is a general appointment to make sure your child is well enough to enter the US. She was fine except for a terrible rash that developed a few days back. The doctor there agreed with us that it was heat rash. She is covered with it! Here we are waiting our turn! This picture shows how she reacted to the nurse checking her ears. She was not all impressed! She was equally impressed with the weight check as well. And of course her temperature! We have noticed some of her coping behaviors now as well. Mariah came to us on Monday with a rattle in her chest and I also noticed scratches on her legs. It looked like fingernail scratches. Well, we have learned that when she is stressed or bored she scratches herself. This is likely a self-soothing technique that she began in the orphanage. She also rocks while standing. At first we thought she was dancing, but have since realized that it also is done as a way of coping. These behaviors will likely diminish on their own as she begins to trust us and understand things better. Until then, we stop her from scratching and distract her. I am amazed at how much English this child is picking up on. She understands things like, "Let's put your shoes on (or away)", "sit down"(in the bathtub), "do you want some?" and several other phrases. She is an observer! Her eyes tell a story. Mariah is going to fit into our family as if she was always there. Her disposition is perfect for us. She took a nap yesterday in my parent's hotel room. I was there as well as Jeremy was napping in our room. Well, I dozed off on the chair and Mariah was on the bed. Then I heard, "Mama...........Mama!" Can I tell you that those two words were music to my hears. Of course, Jeremy was not there to hear it! But, she has learned that it is safe to call for me. Most importantly, I will come. Still missing Kyle, Micah, Rebecca, and Benjamin. We Skype them every day. When we spoke with them yesterday and to my surprise my sister Tina was also there with her three boys. So, at Tammy's house were 10 kids! What a busy place! Sunday's itinerary with Lifeline allows for us to go shopping. This should be interesting! I am a day behind on my blog but after I explain I hope you all understand. This picture is our picture taken with our province guide/facilitator. Nancy was so much help to us. She took care of us and did not lead us astray. She was also so sweet with our Mariah. Nancy took care of things like showing us where we can get our laundry done, shop for bottled water, writing restaurant menu items in Mandarin, taking care of paperwork and being a photographer. She was pretty terrific. The above picture was taken at NanJ*ng airport. The last thing Nancy did for us was ask a stranger to take a group picture. She did this after getting us our fight tickets and having them give us seats together on Ch*na Southern airline. She also walked us right past the security where hundreds were standing and got us VIP treatment as adoptive parents. The security there allowed us to enter through the first class entrance. We got done and went to our gate......27 clear at the end of the airport, in the basement! We got to our gate at 2:30pm for a 4:15pm departure. Then it got interesting. We realized that people were groaning as Mandarin was spoken over the PA. As it turns out, most of the Guangzhou flights were being delayed. In a country where few speak Engish, this was pretty tough information to come by. We then found out that there was a typhoon coming through Guangzh*u and we were one of the many delayed flights. The problem was, we were the latest Guangzh*u departure. That only meant.......we were the latest Guangzh*u arrival! A very sweet ChInese man heard us asking someone if they spoke English. The person we asked turned his back to us. This man came over and stuck with us the entire trip. He was super sweet. After being delayed several hours, he went and got us the food that the airlines provided us. He brought back a box with four hot meals and 4 iced teas. He would tell us when he was going upstairs to smoke and come right back. He told us how he always wanted more children but due to the one-child policy, they were unable to have any more. He helped us carry our luggage to the bus, which took us to the plane on the tarmac. He then stayed at the baggage claim at 2am and insisted on helping. He wanted to get us a taxi and translate where to take us. We then thanked him and said that our guide was there and he was free to go home to his family. Well, here is our treasure. She was so good waiting all that time. She was on a food strike but did finally break down and eat a granola bar for me. The benches we were sitting on were metal. They were cool and that is about the only good thing I can say about them! We finally boarded our flight! We were listening to the captain's voice over the PA and then everyone moaned. WHAT!!! We don't speak or understand Mandarin. Then the English announcement was made. We were told that we had to wait on the tarmac for at least 1 1/2 hours until the weather in Guangzh*u cleared. UGH!!!! We had a baby who didn't have any true supper or nap. It was 9pm and we had a delay. Finally we were in the air at 11:30pm. Mariah was with me for the whole day. We decided that she needed to realize that I was her Mommy and that I love her unconditionally. I will not leave her! So, it was hard on me. My arms ached terribly. She doesn't help you hold her. She has very low muscle tone and does not walk much. When she does, she is very shaky. She prefers to be held. In flight she fussed for the first 1/2 hour and the last 45 minutes. We believe her ears were bothering her. My sinuses were killing me and Jeremy's ear was bothering him too. Aside from that, you don't really hear much from her. We arrived in Guangzh*u at 2am and our guide, Rebecca, was there waiting for us. By the time we got our luggage and got to the hotel it was 3:15am. Check-in took a few minutes and we went up to our rooms. They are beautiful! This entire hotel is incredible. We are staying at The Garden. We are amazed at it's beauty. The provincial hotel had a lot to be desired. We felt like we walked into a little paradise. Here is the bedroom part of our suite! Here she is. I had to give her a bath at 3:45am. I hated to do that to her but we had a mandatory medical exam in the morning and she was so sticky from us trying to feed her. She was so sleepy! I will try to update more. Today we had her medical exam. She was not impressed. She cried when they looked in her ear! Tomorrow we meet our Lifeline group and go shopping with our guide, then lunch, then group photo at 4pm. I still miss my other four kids terribly. This is a beautiful place but we would love to be home. Kyle, Micah, Rebecca, and Benjamin.......we love you so much! Talk about a very difficult day! Today was by far the hardest yet. We had a very late night with Mariah. She was very restless and woke several times. As soon as we got up this morning I could tell it was going to be a tough day for her. I already knew it would be tough for me. Mariah has been really congested since our Gotcha Day and today was no exception. However, as I dressed her for the day, I found more of the slight rash I saw last night when I bathed her. To put it mildly, she was pretty miserable. She barely ate breakfast. Below is a picture of what she looked like for our trip. Keep in mind, there are no car seats in Ch*na. We left to visit her orphanage around 9am. The drive took about 1 1/2 hours to drive from Nanjing to her home city of Changzhou. Today her grieving was really bad. She only would go to Jeremy. She preferred him yesterday but today it was only him. We agreed that Jeremy would be the designated baby- holder for this visit. Well..........she got sick on the way and threw up all over Jeremy. Poor thing, it was pitiful. We were kind of glad she only had a few Fruit Loops and water for breakfast. 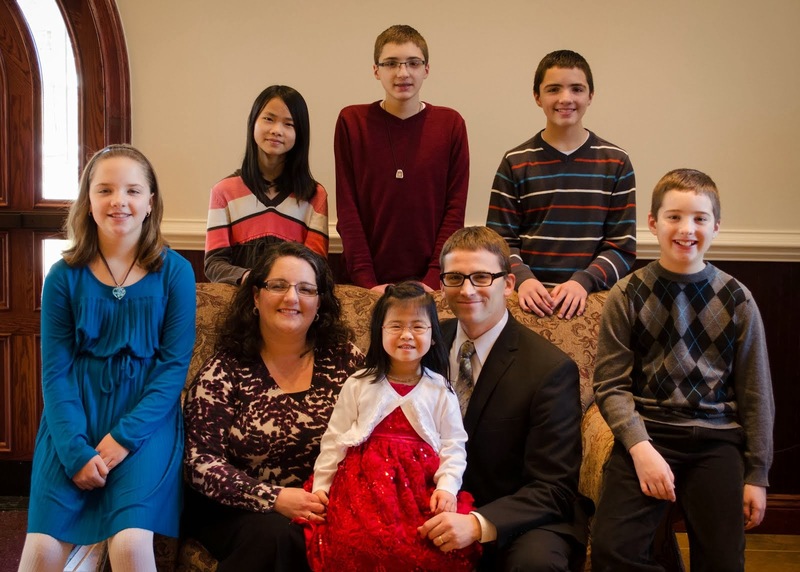 "Warm welcome to Chang Lu Ping and her new American family." Today our daughter walked through those front doors of that orphanage as a visitor, not an orphan! More importantly, she walked out of those doors with a family! What a beautiful story! I was prepared for Mariah to enjoy her time there. And she did! The Half the Sky Nanny (who is very "grandmotherly") came over to her and Mariah lit up. I was happy to see that. She reached for the nanny and went to her. I did really appreciate the nanny making such a huge effort to let Mariah know who we were. I was more impressed that when they asked her (in her Changzhou dialect) where "mama" was......she pointed to me! Then she pointed to Jeremy when asked where "baba" was. Then what really surprised me was they asked her where gon gon was......she looked around the room and her eyes stopped on my dad! She did the same for my mom. Her eyes tell it all. This sweet nanny got Mariah to call us Mama and Baba. That is the very first time we heard her say that. It was sweet to hear! When it was time to get back to work the nanny offered Mariah to Jeremy, which Mariah went to gladly, and the nanny ran out of the room crying. I feel blessed that my daughter was loved. Then the orphanage director and assistant director gave us a quick tour of their facility. It was heart breaking to see all those babies just lying in their cribs. Eerily, there was hardly a sound coming from the baby room. I was allowed to take a picture of the crib that Mariah stayed in for the first 18 months of her life. Here was the entrance to her bedroom. That bedroom was shared with 24 other children. Then we were allowed to take a picture of her crib. Interesting that she was the very first crib in the room. Notice the little one lying in her crib diagonally? That is LuXue! Her mom and dad are leaving in a few weeks to get her. She is only 9 days younger than Mariah. Don't be fooled, she was supposed to be sleeping but was wide awake in her crib! I did get pictures of her for her parents. The tour continued into the playroom. It is large and has many toys for the children to play on and with there were screens in the windows but no air conditioning. It is very hot and humid in Changzhou during the summer. This was a very fast tour. You don't waste any time with the officials. They were nice with us but it was obvious they did not want us there much longer. Then we were invited for lunch with the director, assistant director, a nanny and several other orphanage administrators. The meal was amazingly huge!! Do you see the fish at the bottom center of the picture? Directly to the right of that dish is another dish. Eel! No, we did not eat that. They actually asked us if we eat eel and we said no. They were sweet and picked up the dish and set it off to the side. As we sat down to eat, I was told that a nanny wanted to feed Mariah her last lunch there. I did not argue. She ate very well, so I was glad. Lunch went well. We had a quick lesson on proper use of chopsticks. Jeremy already knew but we did not. The discussion was completely in Mandarin but the Changzhou dialect. That was even tough for our guide to understand. It was a difficult day but necessary. We are that link to Mariah's past. Without that, she will always wonder what orphanage life was like. We also visited her finding spot. Wow! We both had such a tough time with that. Just to think that our baby girl was abandoned at only 1 month old. We are amazed that God has blessed us with the opportunity to be her family. The orphanage director kept telling us how lucky Mariah is. I quickly told her that we were the ones that are blessed! We leave for Guangzhou tomorrow. I hope it has fresher air than what we have seen. The polution has been horrible. You cannot even see the surrounding mountains in the distance. Maybe some sunshine will help Mariah. I spent part of the evening on the phone with her doctor at the International Adoption Clinic in Cincinnati, OH. She was so sweet and agreed that the antibiotic needed to continue. Mariah also has a terrible itchy rash all over her tummy. She is scratching like crazy. Of course, the one medication I did not bring was Benadryl. Jeremy and my dad took the adult Benadryl that we have here for adults and went shopping. We figured if all else failed they could look at the bottle and ingredients. They went to four stores and no Benadryl. So the doctor told us how to make what we had work. We are hoping it works. I also gave her some ibuprofen. After I told the doctor that, she was glad I did. No reason not to for now. It could be a multitude of problems....ears, throat, chest, joints etc. The doctor said to just keep the ibuprofen in her system. Signing off for now from China. I need some sleep. This was the beautiful scene we saw as we drove up to the Nanjing city gate this morning. Our guide wanted to take us there and now I can see why. So, for a little history here we go. Nanjing was the capital of Ch*na during the Ming Dynasty. These gates within the walls of Nanjing are original. They were built in the 1400's. It was amazing to see them in such good condition. An interesting fact we learned was that each brick weighed the exact same weight. The brick-maker had to inscribe his name and information onto the surface of every brick he made. This was in case there was a problem with a brick or it broke etc. The inscription would lead the soldiers back to that brick-makers house and he would be killed. How would you like that? This picture shows some of those bricks with the writing on it. This is a picture of the gardens around the city gate, and of course, Jeremy back-packing Mariah! Nanjing has twenty-seven city gates. Within each gate was a tunnel. Those tunnels each held 100 soldiers. At any given time during the Ming Dynasty, there were 2,700 soldiers guarding the city. The following pictures show the beauty we watched from the gardens to the surrounding Qinhuai River. This picture below is Mariah and her new piece of jewelry. After we finished at the city gate, we then went to a Jade store. We wanted to get Mariah something specific from her province. Since my idea of buying her a set of combs from Changzhou was foiled by the orphanage buying each of us a set and then my idea of pearls from the pearl market was foiled by the adoption registrar giving her a string of pearls.....we had some fast thinking to do. Jiangsu is known for many things. But one thing we have learned is the skilled craftsmen that populate this province. Jiangsu is known for the hand carving of Jade. So, we went to a Jade store. The jade was certainly on display but so were we. We had so many people comment on us with a Chinese baby. It has been a little surreal to see the attention we draw. The people in her province just do not understand it. It has opened doors to communicate a little. Since we learned the Mariah's name also means "Peace" we saw a jade pendant that was in the shape similar to a life saver. When we asked what that shape represented, the sales person told us that it stood for peace. We purchased that pendent and they gave us a beautiful necklace made out of silk with small pieces of jade within the chain. Here is picture of our sweet Mariah wearing her necklace. Tonight we again walked the Confucius Temple market area. It was fun!!! Again, we drew attention. No one has been brave enough to ask us for a picture with them but it has been very obvious with the attention we have attracted. We do ask for prayer as this precious child is having a difficult time with grieving. We knew to expect this but it certainly does not ease the pain of watching her work through this process. She does not trust me and gladly goes with Jeremy. She has been in bed for 3 hours and has been up several times. This is not what the past two nights have been like. She has slept great until tonight. We are praying that the Lord puts her mind to rest and allows her to begin healing and trusting me. All in the Lord's timing and not ours. That is definitely one thing I have learned in this process. She is our child for such a short time.